Skiing in Savoie, but with a distinctly (and refreshingly) southern feel beside the Franco-Italian border. Road access from Modane is quick and straightforward (and direct TGV rail services mean it’s just 4hrs from Paris). The most practical budget-flight destinations are Chambéry Savoie Mont Blanc and Turin – each around 100km away. If a plan to link Valfréjus with Bardonnechia (just across nearby Franco-Italian border) ever becomes a reality this place will finally acquire the major-league status it deserves. For now, though, it quietly gets on with providing great skiing for all levels, with some worthwhile off-piste potential (although freeride terrain is more limited than it appears, owing to avalanche risks of steeper off-piste terrain). For novices and intermediates a single gondola ride heads straight to the main Plateau d’Arrondaz area (2222m), from which there’s a choice of tree-lined return runs back to the village. From the Plateau an onward high-speed chairlift heads up to Punta Bagna (2737m) for blue, red and black-graded pistes amid truly startling scenery. Valfréjus has its origins in the old mountain hamlet of Carmaix (1550m), and stringent planning constraints mean that all new construction follows solid, traditional Savoyard design cues. It therefore blends particularly well into the surrounding mountainside, much of which is attractively forested. Most of the accommodation and services are located close to the Arrondaz high-speed gondola – the only lift access to the ski area. 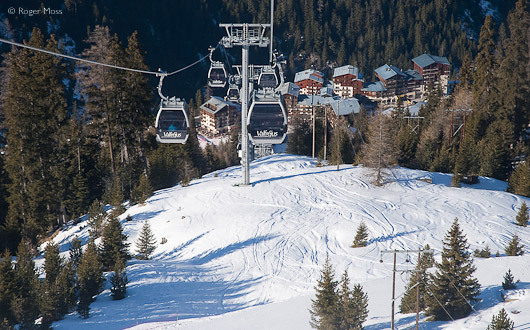 Those based at the opposite (entry) end of the village have a green-graded link run over to the gondola, accessed by a 4-seater chairlift, and can return at the end of the day via a choice of blue or red graded descents. 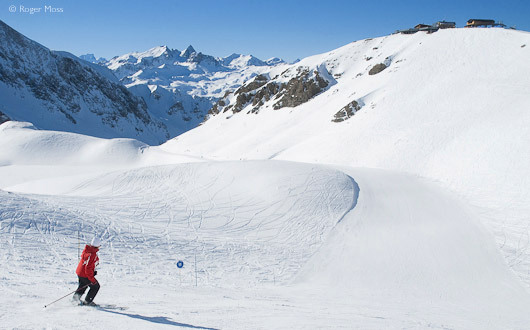 Why go skiing in Valfrejus ? 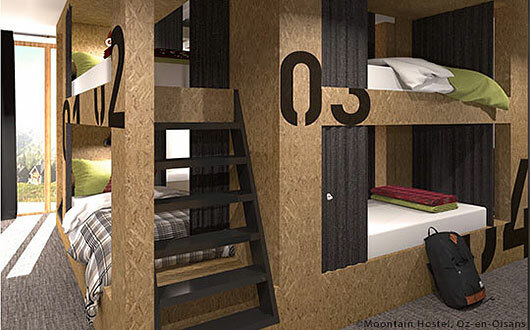 Young and budget-conscious family skiers - and anyone who values a quality, slightly ‘lateral-thinking’ alternative to the more obvious (and more pricey) big-name areas. The skiing is varied, amid some of the most unspoilt scenery around. 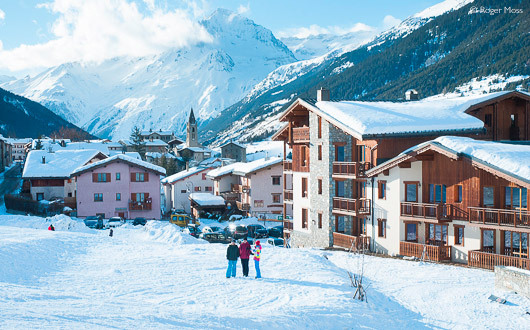 And while the mileage may not seem that great, there's the ESKI-MO ski pass giving free access and transport (one day per week to each ski station) to the nearby resorts of Aussois, Val Cenis Vanoise and La Norma. Any other resort in the Maurienne is accessible at a 40% discount if you possess a minimum of a 2 day ski pass. 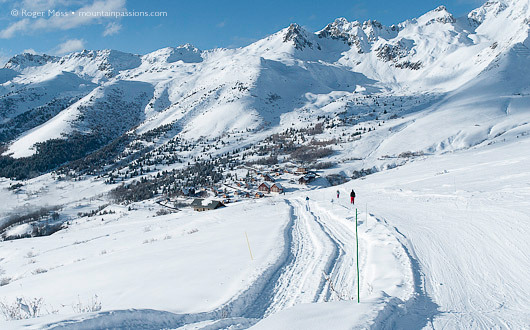 Alternatively, for a supplement to the Valfréjus pass, you can ski from Orelle into Val Thorens and Les Menuires. Just 20km away, it’s an easy drive (navette every Wednesday) and the 3 Vallées Express high speed gondola takes just 15 minutes. It all adds up to a very appealing package. Massive recent investment in high-capacity lift infrastructure. 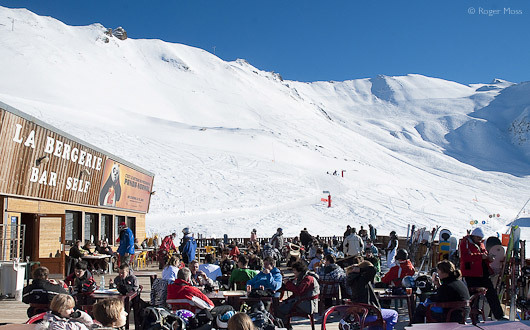 Aussois and La Norma share the Valfréjus six-day lift-pass. Self-catering accommodation to suit most budgets. Planned link over to Bardonnechia has yet to become a reality. Lower return runs can lose snow-cover late in the season (but you can take the gondola down). Enjoy stunning back-to-nature skiing behind Punta Bagna on the blue-graded Combe and Lac pistes. The La Turra residence is sited near the base of the village and enjoys access to pistes just 60m from the front of the building. Given good snow conditions it would therefore be possible to ski back almost to the door. We stayed in a two-bedroom apartment with a balcony overlooking the valley, with mountain views. It was comfortable and warm and had a well-equipped kitchen, TV and WiFi access (payable). A huge bonus is lift access to all floors - great for carrying luggage. Underground parking with direct access to the lifts is available though limited (and payable). 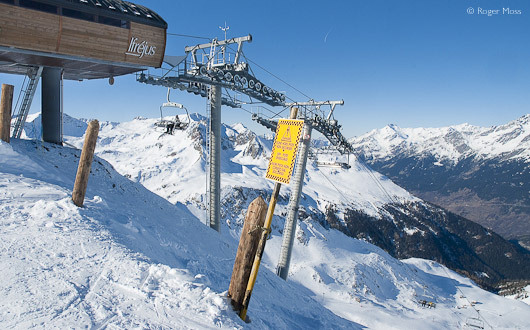 Ski lockers are situated under the Reception lobby and close to the nearest piste. It's a friendly, welcoming residence and would suit families. Note that ski-school meeting points are in the main village, a good 10-minute walk in ski boots. Alternatively, if confident, take the nearby lift and then the gentle Escargot link piste. Other facilities include free access to the outdoor heated swimming-pool with panoramic views and a sauna, fitness room, plus a cosy bar with log fire, where we enjoyed a delicious breakfast (payable option). Medieval chapel in an extraordinary location on the banks of the gorge at the foot of the village. There's a signed footpath to the chapel, and a visit to the site is a pleasant walk any time of year. There is a pilgrimage here each September from Modane, the Chapel being the last of fifteen oratories visited. The story of this historic Franco-Italian rail link (the first Alpine tunnel, completed in 1857) is told in a small museum-style display. A steam locomotive emerging from the stone portal adds to the impact of the site, which sits beside the route from Modane to Valfréjus. the search box to look for a convenient location nearby. Take the A43 autoroute to Modane, exit and follow signs to Valfréjus on the D216. The nearest airports are Chambéry Savoie Mont Blanc and Turin, each about 100kms away. From Turin you can arrange a private transfer from the airport (best for small groups) or hire a car, but be sure to factor in the cost of both Fréjus tunnel and autoroute tolls. From Chambéry, there are regular trains to Modane where you can get a bus to Valfréjus (9€ adult return). Reserve your journeys with Altibus. It's just a 4hr high speed train journey from Paris to Modane. The Paris-Milan train is direct, alternatively, you can change at Chambéry for Modane. You can get a taxi or bus from here to Valfréjus (9€ adult return). Reserve your bus journeys with Altibus. The drive up from Modane only takes a few minutes, yet somehow we seem to have repeatedly passed Valfréjus by until now, when we finally get to satisfy our curiosity. Maybe we should have come sooner. In a typical year January should find the Maurienne (and the rest of the French Alps, in fact) subsumed in snow and enduring temperatures well below freezing. Our visit, though, turns out to be anything but typical, and while it’s bitingly cold the snow-cover at lower-lying areas looks distinctly patchy. Fortunately, at 1550m things are altogether more reassuring, and as we roll into Valfréjus at nightfall there’s little doubt that we’re in a ski village – and as far as we can tell in the darkness, a rather stylish one. 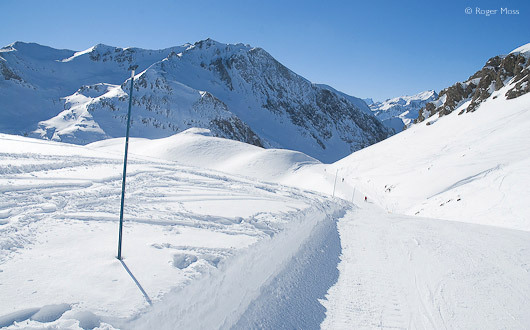 This is just the beginning – the Jeu piste offers a further 10+ kilometres (along with almost 800m vertical drop) of blue cruising along the sides of the valley, all the way back to Valfréjus village. Gentle novice terrain served by simple draglifts on the Plateau d'Arrondaz. Next morning we peer out onto an appealing picture of mountain scenery, complete with extensive forests of pine and larch. After heading over to the Arrondaz gondola lift we start get the bigger view, and a rapidly-changing one, too – operating at around 6m/sec this is one of the fastest lifts we’ve ever ridden. Once above the tree-line the steep climb eases as we cruise smoothly over the Plateau d’Arrondaz, where the first of the day’s skiers are now assembling for their respective ski-school classes. The surprisingly good snow-cover confirms everything they say about the area catching just about every weather front heading across the nearby border with Italy. Once the lift has touched down we snap into our skis and pole our way towards the nearby chairlift for another high-velocity ride, which this time will take us to Punta Bagna, at 2737m the highest point on the mountain. This time the climb begins gently before ramping up the angle of attack for a more dramatic final ascent, which in early morning shadow adds to the chill-factor. Much more so, in fact, than would have been the case for this lift’s predecessor, the trade-off being that the old Punta Bagna II gondola would have been affected much more by gusting winds than the powerful six-seater chairlift. Whatever the logic, at the top we’re more than glad to be back in full sunlight once again. Better still, despite the altitude, today there’s barely a breath of wind, so before putting in our first runs of the day we head onto the large panoramic sun-deck of the nearby bar/restaurant to warm up and take in the scenery. 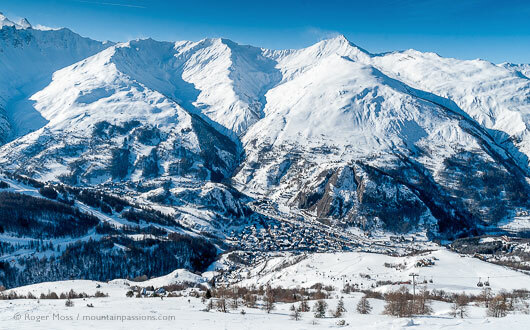 Ahead lie jaw-dropping views of the snowy vastness of the Italian Alps, while somewhere to our right lie the linked ski areas of Valloire and Valmeinier. Faced with this awe-inspiring sight today, it’s easy to understand how Valfréjus and its French and Italian neighbours once dreamed of linking their terrain to create a ski domain of epic proportions. Sadly the project (named Croix du Sud) never materialised, although the more modest aspiration to a link over to Bardonnechia could still happen one day. We certainly hope so. For now, though, there’s plenty to see right here in Valfréjus, so we snap back onto our skis and head off on the blue-graded Crêtes for a long cruise which takes us first along the spine of the mountain before turning sharp right onto a quite steep descent on Col, which is still graded blue, since it’s more than wide enough to reassure timid intermediates. Right now it’s also still in shade, but lower down we ski back into the sunlight as the pitch eases for the final run on the Plateau d’Arrondaz. It’s a great run and underlines the fact that the cruising terrain here is perfect for those who like the occasional steep on which to develop their edge control and build both confidence and fitness. The Punta Bagna chair-lift arrives at 2737m, far above the tree-line and the Maurienne Valley. Excellent snow quality and perfect peace beside the Italian frontier, behind Punta Bagna. The Punta Bagna is a point of departure for other options, including speed-riding. Sure enough, after a second haul up to the sensational viewpoint, just beyond the top station of the lift we watch in awe as two paraglider-equipped skiers launch themselves off the ridge and take off from a steep, unpisted section of mountainside. It’s hugely impressive, and not without a degree of risk for those who get it wrong. Meanwhile something altogether more benign had caught our eye while we’d been taking in our surroundings from the viewpoint. Heading left from top of the lift is a gentle-looking blue-graded cruise which accesses the Punta Bagna black for the rather more direct, mostly-ungroomed run back to the Plateau. Just past the exit, though, the blue turns hard right towards all that glorious virgin Italian territory we’d seen earlier. Valfréjus is the youngest of the Vallée de la Maurienne’s ski resorts. That it was created at all to join places like l’Alpe d’Huez, Les 2 Alpes, Valloire Galibier, etc., tells you something about the quality of the skiing on offer. But there’s more to it than that. The resort was planned as a low-impact development, and sits among forests of spruce and larch at 1550m just above the frontier town of Modane, which has both road and rail trans-Alpine tunnels. 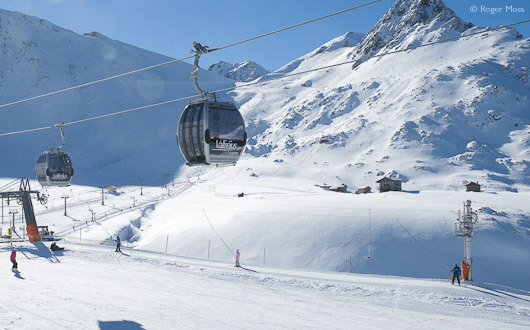 Employing just one powerful gondola lift to access the ski terrain, it’s a model of efficiency, too. Not that we’re planning on crossing the border. For now we just want to ski the blue-graded Lac piste to enjoy the silence and staggeringly unspoilt scenery on this side of the mountain. Further down there’s a turn-off onto Combe, another scenic blue run which makes a gently curving detour before rejoining Lac ahead of the run down to the Pas du Roc chairlift (2323m). In more typical snow conditions this is just the beginning – the Jeu piste offers a further 10+ kilometres (along with almost 800m vertical drop) of blue cruising along the sides of the valley all the way back to Valfréjus village. Sadly the run is closed during our visit, so we make a note to return and ski it one day, and instead take the chairlift to join the red-graded Pas du Roc piste. From here another red (Argentier) would drop us quite steeply back down to the base of the chairlift, but we head back to the Plateau, and soon rejoin the wide blue piste we’d skied earlier. Despite our early arrival, the fine weather finds the first lunchtime skiers already relaxing on the sun terrace of the pisteside Bergerie mountain restaurant. We have to consciously remind ourselves that we’re still in Savoie, as the relaxed, informal mood is very different from that of some of the more conventionally-chic Alpine ski areas just a little further north. After lunch we take the Petits-Vallons chairlift to ski some of the shorter red- and blue-graded pistes which drop down behind the Plateau and its restaurant. It’s useful terrain as a means of progression for ski-school groups who have outgrown the super-gentle green terrain on the opposite side of the Plateau, but of more limited appeal to independent intermediates. Plateau d'Arrondaz, with (far right) distant views of the black-graded Punta Bagna terrain. So we decide to see what the return runs to the village hold. The answer is a surprising mix of intermediate and advanced runs, each of which eventually feeds onto a green-graded final approach – the exception being the choice of red- and blue- graded pistes accessing the area near the entry to the village. The greater part of all these runs is nicely sheltered below the tree-line, which means that if visibility suddenly becomes limited (during heavy snowfalls, for example) those who don’t want to take the gondola down can find their way with no ‘where-am-I’ moments. It’s a good, but until now not a perfect solution, the stumbling-block being the upper section of the Bovenières blue piste, which less-confident skiers found just a little too steep and narrow for comfort. Now, however, this key run has been re-profiled to improve things and allow just about anyone to descend with confidence. 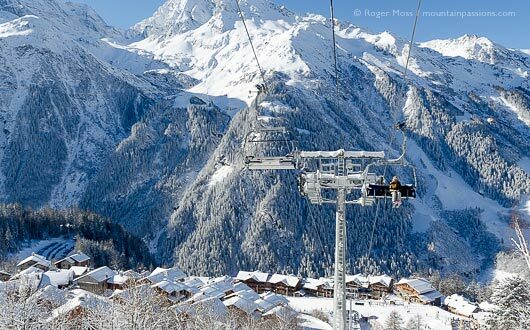 In the space of just a day-and-a-half’s enjoyable skiing in one of the French Alps’ so far lesser-known ski areas we already know that we’ve stumbled on somewhere with a fresh approach to things, and whose time will surely come before too much longer. If and when the link with Bardonnechia becomes more than a long hoped-for dream then we’re all going to be hearing a lot more about Valfréjus. Until then, you can intrigue your friends by having had great value family skiing in a quality Alpine ski area they’ve yet to discover.